Luckily when we arrived it wasn't that busy. I don't think they offer bookings or reservations but I was worried that because we had arrived into London quite late that they'd be no tables or a massive queue. Turns out 2.30 on a Friday is a pretty good time to go. Or maybe it was just luck. Located on a street corner the cafe is pretty easy to spot. It's pink for starters. And there's usually a small crowd out the front. There was a crowd when we arrived but a rather small one. Most people seemed more concerned with getting that insta pic than lining up to sit down. I guess a lot of people come for a picture and leave. We made the most of this and got in the line. Because there were three of us we could still hop out of line and take a picture when the space was free. Plus it didn't matter if we got a picture there and then because we'd be sitting down and have the opportunity to do so then. It didn't take long to get seated and we were very lucky and got one of the door side tables. Definitely more perfect timing than a planned out strategy. We were given blankets when we were seated which I thought was a cute touch, especially as they were needed because it was rather chilly. I didn't feel cold though even though we were outside so that was a bonus. A few people who lined up asked to be seated inside specifically but with the blanket the outside was fine and also a lot better for pictures! One of the waitresses came and collected our order so we didn't have to go inside to order. They also do take aways which a lot of people chose to do. However, in all honesty I think if you're buying a cake, one that's rather pricey too, then you should get your moneys worth and sit down to enjoy it. Maybe that's just me though. We each ordered a different three tiered cake. Each is £6.20 and to be honest it's a bit of a rip off because the cake slices are tiny, especially considering it's a three tiered cake. But lets be honest, it's London so the price of nearly everything is higher anyway. I still paid because it was a treat day and in a sense you're paying for the overall experience as well. The cake was good but not amazing. I don't think it's a place to visit just for the cake. Don't get me wrong it was good but I wouldn't tell someone they had to go and try it. I had the chocolate cake, because you can't really go wrong with chocolate cake. My friends had the Victoria sponge and the rose, lemon and raspberry cake. These were both nice too. I have to say I think the lemon and rose one probably was the best, it had sugary lemon bits in it almost like a lemon drizzle cake. Drinks wise I ordered a latte. It was a pretty good coffee and came in a cute mug. We definitely made the most of our table and took a lot of pictures! It was also a great place to catch up as we hadn't seen each other in four months. One problem with getting there in the afternoon was that it soon began to get dark. We had enough light to get all the photos we wanted. Surprisingly the line for a table got bigger and bigger as we sat there. I say surprisingly as it was getting a lot colder and darker. There were still plenty of people taking pictures though. After spending a good few hours chatting and taking pictures we paid the bill and had a quick wander around the area. We then headed to Sketch where we'd booked to have dinner. They charge £30 per person if you cancel and you have to give them your card details when you reserve which we thought was a little sketchy at first (if you pardon the pun). When we reserved the table we were still deciding between two restaurants but the £30 cancellation fee soon made the decision for us. The decision paid off though. It was a little pricy but that was expected. Also if you like fruity cocktails then try the vanilla cocktail, which doesn't actually taste of vanilla despite its name. 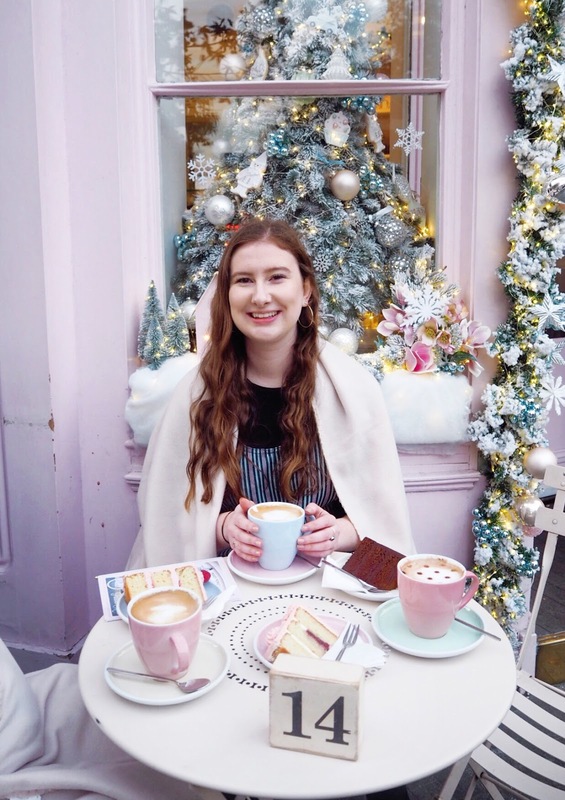 So should you visit Peggy Porschen's? The short answer is yes. 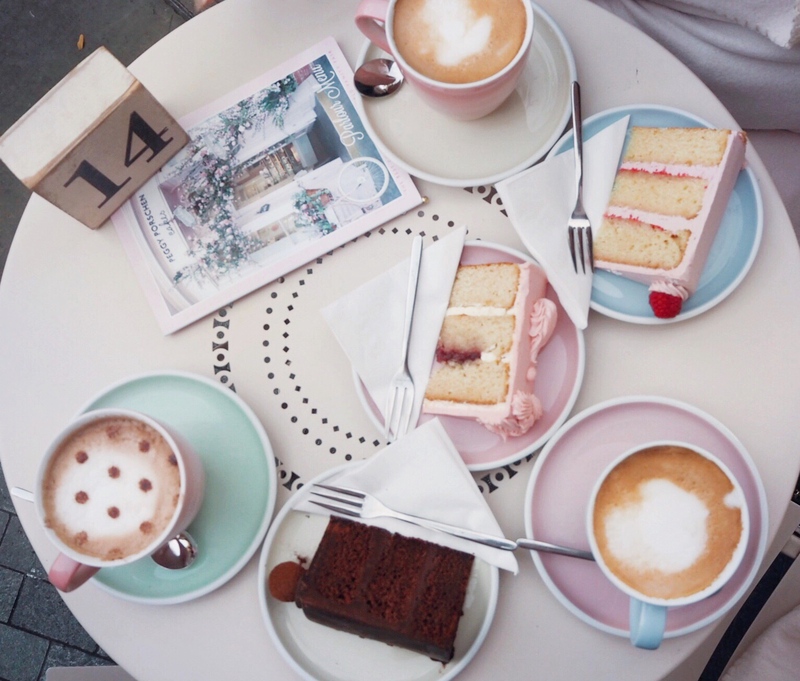 While the drinks and cake aren't the best I've ever had I still think Peggy Porschen's is worth a visit. Even if you just want to get a cute picture then leave. The fact that there is Christmas decorations at the moment makes it even cuter. It's pretty easy to see why this place is an Instagrammer favourite. 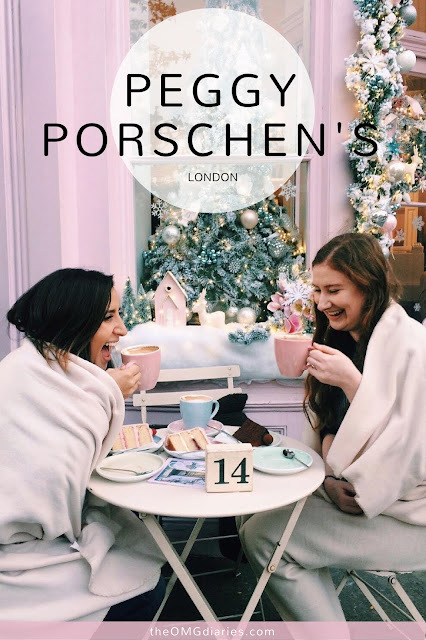 Have you been to Peggy Porschen's? What did you think?